– General Assembly, Measures to eliminate international terrorism, UN Doc. A/RES/69/127 (10 December 2014) (adopted without a vote), preamble. – General Assembly, 2005 World Summit Outcome, UN Doc. A/RES/60/1 (16 September 2005) (adopted without vote), para. 9. Our desire as Canadians for a secure society need not be in conflict with our desire for just treatment, personal freedoms, or respect for our human rights. Since the early days of Quakerism, Friends have recognized that due attention needs to be given to processes and not just end results. In 1693 William Penn famously said, “A good end cannot sanctify evil means; nor must we ever do evil, that good may come of it.” We find this question extremely pressing with respect to the “Anti-Terrorism Act” Bill C-51. Friends do not feel that lack of due process, criminalization of dissent, and expanding the powers of the Canadian Security Intelligence Service (CSIS) to break laws constitute warranted or necessary evils. We are troubled by the Bills’ changing the roles of judges, requiring them to issue rulings on when laws may be broken. Judges are uniquely skilled at protecting rights and upholding laws, not providing guidance on when to break them. When Canada introduced anti-terrorism legislation following the attacks of September 11th, 2001, CFSC concluded that it was developed to appease anxieties rather than to answer any evident need. We found that pre-existing Canadian and international law was already more than sufficient for purposes of reasonable security. We consider that to be all the more true today, and yet Bill C-51 is being moved forward rapidly and with minimal space for debate. We question the extent to which this legislation is based on evidence of need, evidence of demonstrable efficacy in terms of increased security, and is proportional to actual threats. We remember the torture and other unspeakable horrors experienced by innocents like Maher Arar, Benamar Benatta and others whom Canada falsely decided were “terrorists”. These individuals help us recall that laws like the “Anti-Terrorism Act” have far reaching implications for real people. Too often, our security approach has caused incredible suffering due to an unaccountable system with a lack of proper checks and balances and the lack of opportunities to defend one’s self in a court of law. C-51 promises to further exacerbate this problem by granting additional powers without increasing oversight. In our view, security and respect for human rights are complimentary and mutually strengthening aspects of a vibrant Canadian society . We believe that responses to terrorism must be dispassionately based on facts and careful moral judgements. They should take into account a great many factors including: evidence and recommendations arising from the thousands of academic studies about terrorism which have been conducted since 2001, clear and reasonable objectives (requiring a measured and intelligible definition of the actual threat), mechanisms for appropriate oversight of all counter-terrorism efforts, respect for human rights and the rule of law, and respect for the rights of Indigenous peoples under Section 35 of Canada’s Constitution. Canada should rise above rhetoric and fear mongering. Fearful people tend to make unwise decisions. We are not limited to only two options – embracing a loss of privacy and civil liberties or embracing terrorism. However this false dichotomy has often been employed around C-51 . We are also concerned that if Canada undermines human rights and unfairly targets individuals or communities we may create conditions where some become more desperate and angry – thus increasing their vulnerability to recruitment into terrorism. We monitor and engage with these issues on an on-going basis primarily through our membership in the International Civil Liberties Monitoring Group (ICLMG). We encourage you to visit their website and sign up for their News Digest to stay up to date and find ways to take action if you feel so led. 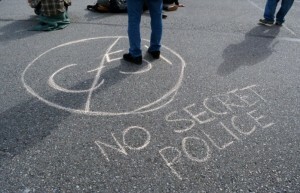 See for example: http://www.theglobeandmail.com//news/politics/anti-petroleum-movement-a-growing-security-threat-to-canada-rcmp-say/article23019252/; http://www.afn.ca/index.php/en/news-media/latest-news/afn-national-chief-tells-house-of-commons-committee-to-withdraw-bill-c. While addressing violent crime and not terrorism per se, much of the thinking behind our 2010 minute Justice is Possible: Compassionate Response as the Foundation for Public Safety is relevant here too. Download this statement in PDF. Learn more about Friends’ concerns around civil liberties.